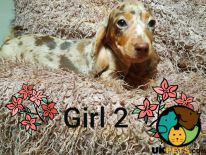 My girl has given birth to a stunning litter of 7 PRA unaffected Kennel Club registered Miniature Dachshund puppies. All have had the absolute best start in life. They have been wormed every 2 weeks from birth with Panacur, I started weaning at 4 weeeks with Royal Canin puppy mouse and now they are completely weaned and love Royal Canin Mini puppy dry food. Raised in a busy family environment they are extremely playful and confident. They are familiar and unfazed with household noises such as washing machines and vacuums. There mom is a chocolate and Tan girl, she has been with us since she was 8 weeks old and is adored by the family, she has a lot of energy and enjoys her works and being made a fuss of. She has been tested for PRA and is unaffected. Her breeder was an extremely experienced lady and an ex show judge, she is one of the best looking mini daxies I’ve ever seen. The sire is a Chocolate Tan Dappled who carries the very rare Blue Gene, which we have tested his pups for and some carry it ( Dd). He is tested and is PRA Clear so none of these pups can ever been affected by PRA. Never buy a Dachshund that hasn’t been tested. He is very small and compact well proportioned dog. Both parents are very healthy and do not have any medical problems whatsoever. I have been in no rush at all to advertise them as I wanted then to go for there first vaccine and wait another week for it to be fully effective before they leave, most breeders don’t do this but I thought it best this way. Each pup will leave with Kennel Club paperwork, microchipped, Insured, health checked, first vaccination and an extensive puppy pack including food. Puppies are priced individually, Chocolate and Tan boys £1300 Chocolate Tan Dappled boys £1400 Chocolate Tan females £2000 Chocolate Tan Dappled female £2500 Chocolate Tan Dappled female carrying blue £call Your welcome to come and meet them with there mom and their aunt whoever you want and feel free to ask any questions you have. I may ask you to show ID prior to your visit for security purposes. No withheld numbers please. My beautiful miniature dachshund self whelped five healthy pups. KC Registered. PRA Clear Father carries Blue genie This loving litter has been reared up in our family home with children. They are free from worms and flees. Up to date vaccinations. Vet checked. Microchipped. 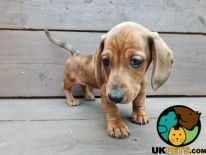 Chocolate/tan female = Sold Chocolate/Dapple female = Sold Chocolate/Dapple Male ?1800 Chocolate/tan female ?1800 Chocolate/tan female ?1800 Each dog will include KC reg papers. Free five weeks insurance. Free puppy blanket and toy. Ready to GO!